Springform pan, 9"dia. 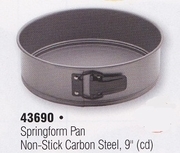 Professional quality carbon steel base provides even baking, while the premium non-stick coating allows quick release for your baked goods. PFOA free.